In today’s article we’re going to take a look at how to skate faster on the ice, and exercises you can use that will help you become a faster skater. 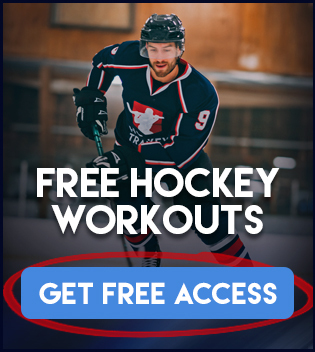 In addition to reading this article, I would highly recommend downloading the FREE Explosive Speed Package here where you will get instant access to even more content and hockey workouts to make you a faster skater that is not available here. 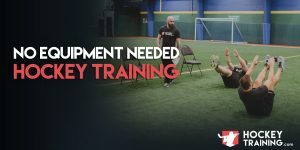 Those of you that follow HockeyTraining.com and have been following my work for a longer period of time now know that I always back up everything that I say in regards to why I use the training methodology that I use to allow hockey players to reach their maximum potential and make it to the next level of performance. At this point now I have discussed elite hockey conditioning extensively online through various hockey training blog posts, guest articles on different sites, videos, and a webinar all dedicated to the topic of hockey specific conditioning. Speed, on the other hand, is a topic that I haven’t covered yet as extensively as conditioning, and I will cover some more speed questions in this “how to skate faster” article. Hockey Speed is a highly complex topic to go over, which is why I also cover it in our Next Level Speed program in even more depth for those who are interested, but we will dig into it a little bit today. If you can skate faster, you will make the jump to higher levels of hockey. Remember, speed is its own variable. Conditioning is a part of speed, but speed is different than conditioning. Power and strength training play a role is speed, but speed is different than power and strength development. These may all play a role but they hardly address the in-depth intricacies that go behind proper speed development. Improving speed means improving stride length vs. stride frequency (which I talk about in this speed video), agility, explosiveness, starting speed, top speed, acceleration, mobility, flexibility, skating + running technique, relative strength + many other smaller factors that are sub-categories of these stages of speed. I wanted to make that point first before diving into the two most commonly asked questions about speed and conditioning because it is important to note that they have some carryover to each other but they are also separate qualities. So to use the terms interchangeably is technically incorrect. I make this point because the way in which people ask me these questions is structured as if they are identical, which couldn’t be further from the truth. I also made the above point just because I am excited about this speed project and wanted to give you guys a little heads up, both athletes and coaches are going to love it and get massive results running the program. #1: What is the most functional exercise we can do to skate faster? This isn’t going to sound exciting, but it is my job as a coach to be completely honest with you to ensure you are not falling for any incorrect training methodologies currently on the market. The criteria in which would deem a movement “functional” would be to utilize the same muscle groups, have the same range of motion, incorporate the same intensity of muscle contraction, last the same duration of time and would have to be executed in the same plane of motion as the sport specific movement. The only truly functional training you could ever possibly do is play the actual sport itself. “Functional” sport training does not exist. There is nothing more time wasting you could be doing than holding a weighted hockey stick and stick handling. Or, balancing on a BOSU ball and stick handling or shooting. I promise you this will have zero crossover into the game of hockey, and I shake my head when I see this stuff online. Holding a weighted stick creates unnatural movement patterns that you would NEVER be using during a game. Additionally, if you wanted to strengthen the rotator cuffs and forearms, why wouldn’t you use better and more targeted exercises to get the job done? Strength will express itself where you create it. An example of this would be saying that squats won’t help your running or jumping power because it’s not identical to those movements – this doesn’t make any sense. Another example would be saying chin ups and lat pulldowns won’t help your slap shot because you aren’t doing a slap shot movement pattern when you are doing those exercises. This is incorrect, the slap shot is highly correlated to lat strength and strengthening the lat will express itself in any movement pattern, not just lat pulldowns. To address the BOSU ball, at no point on the ice are you on an unstable surface so why is this deemed functional? Because you are wobbling? How is that functional? #1: Since you are unstable, you have to slow down your movements. Slow eccentric and concentric movements = slow athletes. To properly train the muscle fiber recruitment utilized in fast explosive movement you have to train fast and explosive. The training principle of Specific Adaptation to Imposed Demand (the SAID principle) has been around forever and people seem to forget this. Moving slowly = moving slowly on the ice. You are training the wrong recruitment patterns and teaching your body to be slow. #2: You drastically decrease the load you are able to use. One of the biggest factors to speed, conditioning, and overall hockey performance is strength. If you sacrifice strength you sacrifice so many facets of your game that I would have to write a whole other blog post on it. 10 times out of 10 the man squatting 400lbs on the ground is going to be faster, harder to knock off the puck and have a hell of a lot more power to express on the ice. Now take the whole methodology of “unstable” surface training of improving “balance” on the ice. First of all, if you are off balance on the ice, these are skating technique problems you should be addressing, not strength problems. Second, hockey-specific balance is entirely about strength. Unless you are falling over and wobbling on the ice like a baby giraffe for no reason, the only thing that is going to knock you off balance is another player trying to either body check you or win a battle for position in front of the net. The stronger man is harder to knock off the puck. So when it comes to functional training, my definition is far different than some of these other coaches out there who think you need a bunch of silly equipment in order for an exercise to be deemed functional. Functional training to me means observing the biomechanical, physiological and bioenergetic demands of the sport and segmentally working backward in determining kinetic segments, muscle actions, intensities and energy systems required for each athletes position. That is TRUE functional training and this approach can provide real answers and programming direction for more functional adaptations. Functional training is done through a proper analysis of the game and properly structuring and periodizing a training schedule to be followed either during the off-season or in-season. 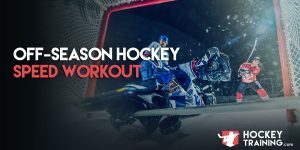 The exercises listed above will all be used in our Hockey Training Programs, so head on over to our programs page and find a program that will help you become a better hockey player! #2: Should hockey players be sprinting in the off-season? Let’s get into both parts to this question. I strongly believe all hockey players should be sprinting in the off-season. An important thing to understand is that too many athletes and coaches overuse this lateral motion trying to mimic the skating movement pattern. This is a big reason why so many hockey players have knee pain, too much repetitive motion. Think about it like this, a computer worker doesn’t get carpal tunnel syndrome or lots of inflammation in their wrists because typing is such high-intensity task. They get it because of too much repetitive motion. Same goes for hockey players, if you mimic this motion all the time you are going to run into knee issues or knee inflammation. Not because the movement pattern is “bad”, but because you do it so often. I have also mentioned structural balance a lot in the past in reference to hockey players over-developed vastus lateralis in comparison to the vastus medialis. This is because of this exact lateral motion. We don’t want to encourage this motion any more than we need to, it will only create more problems and deeper structural balance issues. The imbalance will only become compounded if you focus your attention on these “functional” movements. Knowing this, hockey players need to have a heavy focus in the off-season on developing the vastus medialis and hamstrings with the time that they have before they are back into playing again. Developing these muscles is going to create more balance and ability to be faster and prevent injury. Sprinting helps this process along as it is not a lateral movement. If you increase the athlete’s ability to create force, it will enable him to transfer into a great stride length. Sprinting is one of the most explosive things an athlete can do and when you increase their sprinting speed, you will also be increasing their skating speed. That’s it for this blog post on skating faster, but if you are interested in a training program that is guaranteed to make you a faster skater check out our Next Level Speed hockey training program! Hey Dan I’d like to ask you about what you said here “10 times out of 10 the man squatting 400lbs on the ground is going to be faster, harder to knock off the puck and have a hell of a lot more power to express on the ice.” A bit of a follow up on balance training I guess. I agree that he will have more power and probably faster and even harder to knock off the puck most of the time. I understand the importance of training for speed and power and know how to train for it and a lot of that as to do with your great videos and info you put out. But when one is on the ice and they are reaching for the puck or on one leg won’t the smaller muscles in your leg, the stabilizers come into effect and help you from falling or being pushed off stride when someone is leaning on you or gets a glove on you? I would assume that they would come into play just as much or even more in such or some situations as would say having strong hamstrings, glutes and quadriceps. Just like to hear your input on that. Hey John, thanks for the kind words and for checking out the content I’ve put out. Hamstrings, glutes, and the quadriceps do stabilize you, as well as the many other leg , core, and back muscles being trained during the squat and other stable-surface compound movements. The misconception exists in that people believe that in order to train stabilizing muscles, you need to be off balance, this simply isn’t true. Being off-balance, as articulated in the article, takes more away from the sport specific demands of hockey than it does provide benefit towards it. Balance equipment isn’t a bad thing when utilized in the proper context, I have my pro hockey players utilize certain tools for ankle stability, as well as I have them perform certain exercises in an unstable environment so I can gauge their structural balance and individual movement patterns. But, this is for 3-weeks of the entire 1-Year periodization, and it is only immediately after the in-season when they are at their weakest so that I can see where they need the most work moving forward. But, “the most work” is done in a stable environment because you can create a stabilization stimulus much more efficiently in a stable environment. I know that sounds a little strange, but a good example is the Bulgarian split squat. This is a phenomenal stabilization exercise for both the lower body and the core due to it’s unilateral and unique execution, that doesn’t require any wobble equipment, and is superior to any wobble equipment exercise due to the fact that you can use a greater load, PLUS move faster while doing it. Making it a stabilization + speed + power + strength movement. Not to mention, stability equipment has a much higher injury-risk, which isn’t really my cup of tea when other exercises will do the job better anyways. Always think in terms of cost vs. benefit, wobble equipment provides some benefit in certain context, but in the grand scheme of things is far down on the list of to-do’s for hockey performance. When you bring up the example of being on one leg, or being pushed, that’s no different; the stronger man is going to win that battle (provided he trained specifically for hockey of course). To make the example extreme, using the balance-logic would be akin to saying that anybody who does Yoga would be harder to knock off the puck than a 400lbs squat hockey player, this wouldn’t happen. I hope this helps. If I had to wrap it up in one sentence, i’d tell you that the both the major and minor muscle groups are trained in compound movements, and that you can do this much more efficiently around the year with stable-surface training.